When choosing the ideal career match, many recent graduates seem to forget about the computer science jobs available in bioinformatics. As a somewhat new and small field, bioinformatics is often defined as the application of computer systems to the management of biological or genetic information for discovering medical breakthroughs in the treatment of human ailments. Since the recent explosion of publicly available genomic information from the Human Genome Project, the demand for qualified bioinformaticians has increased quite rapidly. In fact, Nature magazine reported that the number of jobs listed in bioinformatics increased by 96% in just one year. If you are interested in joining this growing scientific area, the following are some of the top computer science jobs available in bioinformatics. Within academic institutions or government-funded research laboratories, bioinformatics researchers are hard at work conducting complex research studies on biologically relevant problems through their expertise in technology. Due to the high level of knowledge needed, most bioinformatics researchers are required to have a Ph.D. in Biology, Physics, Statistics, Mathematics, Computer Science, or Software Engineering. On a day-to-day basis, bioinformatics researchers are responsible for conducting studies on human diseases, developing new technologies, analyzing medical samples, designing programs that improve health outcomes, running research laboratory functions, and writing research grant proposals to receive proper funding. For individuals with a bachelor’s or master’s degree in computer science and a strong background in statistics, there is the possibility of becoming a bioinformatics analyst. With high levels of expertise in complex algorithms, computer databases, and software, bioinformatics analysts are responsible for working through biological data to study the life cycle in hopes of developing cures for common human diseases. While consulting with researchers, analysts create bioinformatics databases to manipulate, present, organize, and update biological data. Many bioinformatics analysts decide to double major in computer science and biology to receive the specific skills needed for this career path. Bioinformatics analysts are in increasing demand for employment in universities, laboratories, research firms, private businesses, and government agencies. As one of the best computer science jobs available in bioinformatics that blends scientific computing with biological research, bioinformatics engineers or developers are given the responsibility of creating the software tools that are used by analysts and researchers. While some engineers do perform research themselves, the majority is more focused on designing the algorithms, data structures, software tools, and computer networks needed to ensure bioinformatics research continues to thrive. Since solid computer programming skills are a must to get started as a bioinformatics engineer, earning a Master of Science (M.S.) in Computer Science is the most popular option. However, engineers can also benefit from having supplemental coursework in software engineering, statistics, and biology to truly understand the infrastructure that is needed to make bioinformatics function. 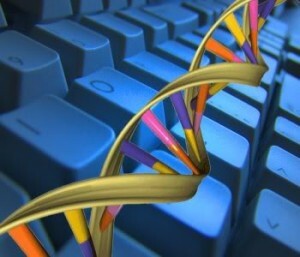 Through blending computer science with molecular biology, the emerging field of bioinformatics is growing in prominence for applying the technological advances of computers in conducting biological research relevant to human health. In order to put your advanced degree to good use in helping advance medical science for potentially saving countless lives, be sure to check out these thriving computer science jobs available in bioinformatics for a rewarding and lucrative career at the forefront of making leaps in the development of medical technologies.